“A thriller set in the world of drug trafficking evokes the high stakes and high risks of the drug trade”--a synopsis of the new movie “Sicario”? Actually this is the first line of the 2000 movie “Traffic” but describes both movies. I had heard good word of mouth about “Sicario” and with 7 new movies opening today I put a question as which one to see on the film buffs facebook page and the vote was overwhelmingly for this movie. All I have to ask is, “why?” Yes, Benicio Del Toro gives a mesmerizing performance, as a former Columbian who was a prosecutor and has good reason to hate drug dealers. 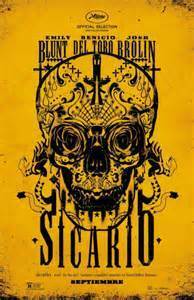 It is explained that sicario is slang for a hitman and he defines the term. One of the many things I didn’t like about the movie is that you will know the reason why before it is spelled out. Josh Brolin, a favorite of mine, as head of a task force but for who unknown, gives a solid performance. I have heard much about Emily Blunt’s performance but I found her to be way out of her depth as an equal FBI agent in the playing field of macho acting men. Anyone who has even seen a movie about drug cartels know it is a rough, tough no holds barred, world of killing and “Sicario” shows that from the opening with a house invasion exposing dozens of rotting bodies in plastic, followed by naked bodies hanging upside down in the Mexican streets. Shortly after there is a scene of the ‘good’ guys slaughtering 8-10 guys in a traffic tie-up at the border. Later there is torturing with water, beatings, forcibly poking of a finger in someone’s ear and, yes, the scene of a lone man shooting, killing 7 men. While the point of violence is necessary to show there are quite a few gratuitous scenes. There is a strong supporting cast from Jon Bernthal as a pickup in a bar to Bernardo Saracino as a major cartel boss and Julio Cesar Cedillo as a minor one along with Daniel Kaluuya, as Blunt’s partner, who requires a suspension of belief to accept his character and Victor Garber as one of the many bosses of the American team along with others. While direction by Denis Villkeneuve is very professional neither he nor the screenwriter Taylor Sheridan bring anything new to the drug trafficking movie including that it is violent and bad guys on both sides of the fence. The opening music was, to me, a blasting wall of sound and at times during the film very intrusive while at times thye camera work of Roger Deakins was really first rate. Now I need to know what the film buffs who recommended the film saw in “Sicario” that I didn’t.